Watching Pete’s Dragon is a very enjoyable experience. It’s a simple story, told well, with gorgeous cinematography, beautiful music, and strong performances. But if calling it “an enjoyable experience” makes you think there’s something off about the movie, well, then you’re absolutely right. 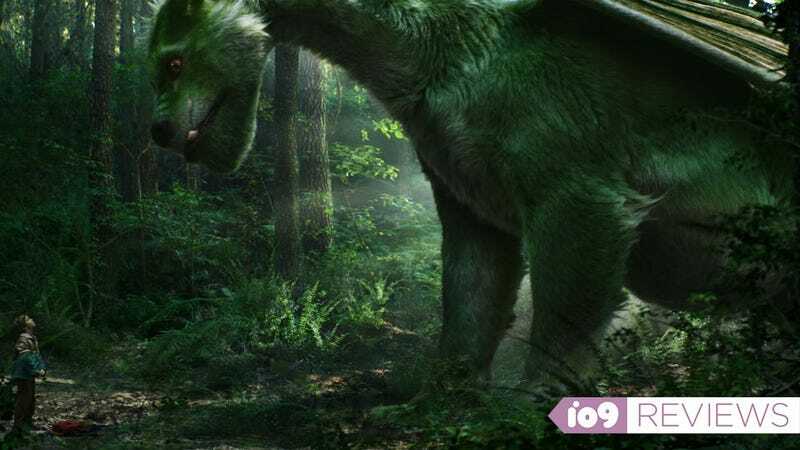 Based on the 1977 Disney live-action/animation hybrid film, this Pete’s Dragon was directed by David Lowery. He’s a director best known for smaller indie fare like Ain’t Them Bodies Saints (which he wrote and directed), Upstream Color (which he edited) and Listen Up Phillip (which he produced). Those varied skills and focused sensibilities fit in well here, as he takes the premise of that original movie and trims it down to a more streamlined, personal story. That story is about a boy named Pete who, in a tragic opening to the film, loses his parents. Years later he’s found in the woods by a ranger named Grace (Bryce Dallas Howard) along with his pet dragon, Elliot. Elliot’s existence then pretty much changes everything for the people around him. While the film starts on a down note and, obviously, builds to a climax, neither feels that emotionally removed from Lowery’s central tone. The soothing score by Daniel Hart, warm cinematography by Bojan Bazelli and invisible editing by Lisa Zeno Churgin all work together with Lowery’s screenplay to give the film the feel of a family vacation. It’s sweet, it’s beautiful, but it’s not quite everything you’d hoped. Some of the times the film gets close to its potential is when Robert Redford is on screen. He plays Grace’s father, a man who claims to have seen Elliot before. Redford’s rustic, captivating presence gives the film some much-needed gravitas, but his role is limited. Mostly it’s about the relationships between Pete, played by newcomer Oakes Fegley, and Grace, as well as the dragon Elliot. Fegley is wonderful in the film’s lead, balancing confusion and wonder in almost every scene. His need for love and family is a strong throughline, but it doesn’t make for much mystery or conflict. Even the film’s villain isn’t that bad. He’s played by Karl Urban, a blue-collar worker who discovers Elliot and decides he wants the dragon for his own. But he’s just a minor obstacle in the way of Pete’s developing relationship with Grace and Elliot—a pebble thrown into an otherwise tranquil lake. It feels odd to criticize a film I generally liked for being too well-put-together but that’s just the case with Pete’s Dragon. Lowery’s filmmaking tools are in perfect sync, but the movie never rises, or falls, to a place where it feels special—you’ll never get goosebumps, shed tears, or feel compelled to cheer. Instead, Pete’s Dragon is a nice, relaxing, summer afternoon of a movie. It’s pleasant way to spend a couple of hours, and not much else.